A new iPhone app is designed to help the deaf hold real-time conversations in English, Spanish, French, Japanese, Italian and German and Mandarin Chinese without the need for sign language or an interpreter being present. SpeechTrans Ultimate for Hearing Impaired does not require an Internet connection. The hearing person speaks slowly and clearly into the user's mobile device and a translated automatically appears on the screen. A Facebook chat option lets users type and have the other party receive a translation on a SpeechTrans enabled iPhone or iPad or directly on a computer. The app costs $99 and is available in Apple's App Store. Myrtle Beach police arrested a South Carolina restaurant owner for allegedly refusing to serve a woman with a service animal. Hrachya Avagyan, owner of Seafood World, told the woman her business was private property, even though the dog had a wore a Service Animal vest and the woman carried the proper paperwork showing it is certified. The law doesn't require a disabled person to reveal his or her disability. Below is the video of country singer John Rich and actress Marlee Matlin performing the song For the Kid during the finale of Celebrity Apprentice reality show. The Philadelphia Inquirer takes a look at how implants are changing deaf education here. Deaf ultimate fighter Matt Hamill lost his main event fight to Quinton Jackson in an unanimous decision in Las Vegas. All three judges scored the bout 30-27 in favor of Jackson. Jackson bloodied Hamill’s mouth just before the bell in the first round, landing a number of power punches in the final two rounds. Jackson improved to 7-2 in the UFC and 32-8 overall. Hamill falls to 10-3. A documentary called In the Land of the Deaf or Le Pays des sourds is out on DVD this week. 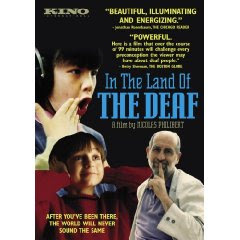 The 1992 film by French director Nicolas Philibert follows the lives of deaf people of all ages and walks of life. The film is presented French Sign Language and French, with English subtitles and closed captions. Philibert's uses little dialogue to let the subjects to communicate their feelings. It earned a Peabody Award for excellence. Detroit rapper Sean Forbes will the stage a week from Sunday at the 9th annual GLAD (Greater Los Angeles Agency on Deafness) Extravaganza at the House of Blues in West Hollywood. Forbes will premiere his new video Let’s Mambo! Among those appearing at the event will be actresses Marlee Matiln, Eva Longoria, Felicity Huffman and Cheri Oteri. Forbes is a co-founder of the Deaf Professional Arts Network. GLAD is a nonprofit organization . There is more information is here. ESPN offers a preview of Saturday's contest in Las Vegas between deaf fighter Matt Hamill and former champion Quinton Jackson here. A jury says a former Texas Tech professor should get half-a-million dollars because the school for discriminating against him because he is deaf. Michael Collier was hired to teach American Sign Language and other courses relating to deaf culture, but was dismissed in October 2006 without a reason. The Lubbock County jury decided his deafness was a motivating factor in Tech's decision not to reappoint him. A school spokesman says Tech was surprised by the verdict. The Washington Redskins' first-round draft pick is deaf in one ear. Ryan Kerrigan played defense for Purdue before his selection for the pros. His hearing loss came after a series of ear infections. He was diagnosed at the age of 8. He says it hasn't hindered his performance on the field. He holds the Big Ten record of 14 forced fumbles and is second second all-time in sacks for Purdue. He won't be the only one on the team with hearing loss. Redskins safety Reed Doughty wears hearing aids. A deaf 20-year-old who allegedly tried to steal a WaveRunner was shot and killed by a 14-year-old in Miami Saturday afternoon. The teen grabbed a shotgun during a confrontation with the accused, Reynaldo Muñoz. The Davis family claims Muñoz threatened them and the teen was protecting his family, but Muñoz could not have verbally threatened anyone because he used sign language and was deaf, according to a family friend. Police say the Davis' statements have been inconsistent. Authorities say the family at first claimed Muñoz was armed, but then changed their statements, hired attorneys, and refused to speak with investigators any more. • Hearing people shake hands. Deaf people hug. • It is rude in hearing culture to point. In Deaf culture pointing is acceptable and quite helpful. • Hearing people have short goodbyes. Deaf people enjoy and cherish greetings both coming and going. • Hearing people find talking with your mouth full as very rude. Deaf people can talk with their mouth full. • The hearing world is often in a rush to get to the point. For Deaf culture, no detail is unimportant! Every captivating story is told in vivid visuals. A Pittsburgh-area deaf woman is in the hospital after being hit by a school bus this morning in Lawrenceville. Police have not released her name and condition, but her injuries are reportedly not life-threatening. The bus driver was on the way to pick up students at the time of the accident. Nearly 400 students graduated this weekend from the National Technical Institute for the Deaf (NTID) in Rochester, New York. 173 received associate degrees, 21 interpreter graduates received a bachelor’s degree, 34 graduated from NTID’s Master of Science program in Secondary Education, and 166 graduated from the other colleges of RIT. Students in West Virginia now get foreign language credit for studying American sign language. The new law went into effect today. There is a shortage of qualified interpreters in the state. A group led by Pennsylvania's Bloomsburg University has won an award for its efforts related to online education for the deaf. The IMS Global Learning Consortium gave the group's platinum award for distance education in recognition of the team's use of Blackboard's online component. The group was led by Sam Slike, the curriculum coordinator in education of the deaf/hard of hearing at Bloomsburg. Here's the 7Up Retro commercial created by Marlee Matlin's team on NBC's Celebrity Apprentice. The finale of Donald Trump's Celebrity Apprentice aired tonight on NBC. Deaf actress Marlin Matlin lost the competition to Country singer John Rich. The two performed a duet together about giving to their charities. In the two-part finale, they competed in launching 7Up Retro by designed a new can, store display and wrote, shot and produced a commercial. Marlee took the ‘70s theme with help from the Harlem Globetrotters while Rich focused on the 80s aided by Def Leppard. His charity was St. Jude Children’s Hospital and she raised money for the Starkey Hearing Foundation. "One thing I'm glad about is that when I found out that a newspaper decided to poke into my tax issues, and they called me and asked for my response I said, I know what's going on in my life, I know what I'm doing. I know what I'm not able to do at that time. But people somehow thought that I was -- I was surprised by it. No, I've made payment plans. And I announced it before they did. And I was glad to take care of the message... I'm paying for it, and I'm keeping my house. And I'm not losing my house and there's no lien at this point that makes me want to lose the house, but $50,000 certainly is a lot of money, but it's -- compared to a lot of people in the entertainment business, who are in millions of dollars of owing money, it's my business and I chose -- and I'm a proud American who is paying it back and made payment plans... I am paying my taxes, and I am paying my $50,000 back. Don't worry, I'm not going to jail. I'm not losing my house and my kids and my husband are fine." The final two contestants on Celebrity Apprentice were guests on CNN's Piers Morgan Tonight. Marlee Matlin and John Rich talked about her being role model for the deaf. Here's a clip. A Florida man is behind bars and facing several charges for allegedly attacking a deaf neighbor. Gainesville police say James Chester Williams, Jr. punched the man outside his house and then broke into the man's home and beat him. Police say Williams told them he and the unnamed deaf neighbor have an on-going dispute and he had been fighting with his girlfriend and her daughter right before the altercation. Washington State Hands and Voices held talent show and walkathon in Seattle yesterday. The video clip below shows the performance of Listen and Talk, a nonprofit preschool program. The two finalists in Donald Trump's Celebrity Apprentice face off tonight. Actress Marlee Matlin and country singer John Rich will go head to head with the winner earning a quarter of a million dollars for charity. Rich says that Matlin is a "superhero" who "ought to have an 'M' on her chest." He went on to say, "She's wickedly smart, and she has a great sense of humor. She's also a great mom." Matlin joked that the show was like "doing 'Survivor' set in New York City. Deaf ultimate fighter Matt Hamill will headline Saturday's Ultimate Fighting Championship event in Las Vegas. Hamill will take on Quentin "Rampage" Jackson in the main event. Hamill is 10-2 in his career and won five matches in a row. If he wins, Hamill will become a contender at light heavyweight. He's the subject of a Hollywood movie called Hamill that will be in theaters this fall. There is more about the film here. Have you ever wondered about the man who interprets for Marlee Matlin? The Los Angeles Times offers insight on Jack Jason here. Here's a video that takes a look at Marlee Matlin's appearance in Donald Trump's Celebrity Apprentice which ends tomorrow night when a winner will be announced. The new director of Pennsylvania's Scranton School for Deaf & Hard-of-Hearing Children is principal of the high school at the Iowa School for the Deaf. Rebecca Gaw was tapped after a 90 day search. The school expects some 40 students this fall at its new location in Lourdesmont. The school will leave its campus in Scranton's Green Ridge area next month. New federal regulations go into effect Tuesday that broaden the rights of employees with disabilities. The Americans with Disabilities Act Amendments Act, or ADAAA, makes it easier for employees claiming disability discrimination to pursue legal action. The new EEOC rules mean employers should no longer focus on whether a disability exists - it likely does, under the law. The focus will shift to whether the disability needs to be reasonably accommodated by the employer. Read details of the new rules here. Colorado Springs police are investigating whether the Colorado School For The Deaf And The Blind violated state law by failing to immediately report a sexual assault on campus. Katrina Stewart says her son was assaulted a year ago by another boy in a bathroom, but because her nine year old son is legally blind, he could not identify the offending middle school student. At the time, school officials said they could do nothing. A year later they have admitted that the offending boy confessed. The Board of Trustees says it is looking into the situation itself. Marlee Matlin is getting a role in the film Silent Knights, which is described as the story of a football coach who takes over a struggling team at a college for the Deaf. With the help of a deaf teacher, played by Matlin, both he and the team grow closer and personally. The deaf actress also has a part on the upcoming ABC Family show Switched at Birth, which premieres June 6. Here's a preview clip. Bank of America picks Seattle's Marilyn Smith as one of its local heroes. She started The Abused Deaf Women's Advocacy Services (ADWAS) in 1984. Watch or read an interview with her here. The tax on phone lines to support relay services for the deaf is dropping in North Dakota. The fee will drop from five to four cents. The state's Public Service Commission decided to make the change, which will take effect July 1st, to save North Dakota $362,000. Significantly dropping the cost of hearing aids doesn't motivate people with mild hearing loss to get one. A new study finds lowering the price by as much as 40% doesn't make a difference. Researchers at Detroit's Henry Ford Hospital say the only patients who will get a hearing aid at a younger age are those with significant hearing loss and full insurance coverage, defying the common assumption that it is price that prevents most people from purchasing a hearing aid. Details of the study are published in The Hearing Journal. Here's a video report from WISH-TV over protesting parents who are concerned the Indiana School for the Deaf is phasing out American Sign Language from the curriculum. You can read the story clicking here. Want to buy Marlee Matlin's home? You can, for $899,000. The Pasadena, California house is up for sale so the Oscar winning actress can pay off $50,000 in back taxes she owes the IRS, according to People Magazine. The house includes several acres to go along with its 4 bedrooms and 3 bathrooms. She bought it 12 years ago for $437,000. Matlin told People, "I'm paying it back. I'm not shying away from it and I'm certainly not ashamed of it. It doesn't mean I'm a bad person. It's reality. It's the reality that a lot of people in America are facing." A Colorado judge has dismissed a lawsuit against a national portrait studio chain, ruling that the EEOC failed to prove that the deaf plaintiff was qualified for the job. The Picture People outlet in Littleton, Colorado turned down repeated requests from Jessica Chrysler for a sign language interpreter. Chrysler was hired as a photographer and wanted help at mandatory trainings and staff meetings. Gallaudet's student newspaper, the Buff and Blue, offers a commentary on campus racism here. Parents of students and members of the deaf community are not happy with the new direction being taken by the board of Indiana School for the Deaf. Governor Mitch Daniels recently appointed four new board members who are not deaf or hard-of-hearing. There is only one member who is deaf and three of the four new board members support oralism. A Daniels spokesperson told the parents who object, "We think there's an opportunity for new board members to bring new ideas for consideration. We hope everyone will get to know them and give them a chance." In the 10th-century sign language defeated the purpose of the vow of silence, according to the book The Finger written by art historian and curator Angus Trumble. He says in Eastern France, "It soon emerged that some monks using the in-house sign language were as chatty, garrulous, and prone to gossip as they would have been if they were allowed to speak." A deaf college student is out of jail in Salt Lake City until his trial on charges he threatening to kill an unidentified professor over his stance on immigration. The judge in the case said Aaron Michael Heineman must wear an ankle monitor and stay away from anything related to white supremacy and go through a mental health evaluation while waiting for his next court appearance. The 32-year-old attends Utah Valley University. Prosecutors say he threatened to kill one of his professors with a Bowie knife and noose. Heineman took issue with the professor's immigration views. Marlee Matlin made it to the final episode of Celebrity Apprentice. During last night's episode, Atlanta rap star Lil Jon and singer Meat Loaf were sent home, leaving Matlin and country singer John Rich to battle it out for victory. Matlin's prospects look promising, she raised $1 million this season, the most money ever during the show. The challenge last night was to create a retro campaign for 7 Up cola. Rich went with the 1980s, using the band Def Leppard while Matlin chose to look to the 1970s and employ the Harlem Globetrotters. They each had to film a commercial, create an ad campaign and organize a challenge. Star Jones, Meat Loaf, and Richard Hatch came back to work for Matlin’s team, while Rich got Mark McGrath, Lil Jon and LaToya Jackson. Rich got his friend Dee Snider of Twisted Sister involved while Matlin located the 1970s spokesman Geoffrey Holder to appear in her ad but he had to back out at the last minute. The program will conclude next Sunday with the crowning of a new champion. First child in Oklahoma to receive a cochlear implant graduations from school. Below is a video report from KOCO-TV in Oklahoma City or you can read the story here. KXAN-TV in Austin explains a new billboard with sign language on it in the video below. Or you can read the story here. Here a video from WDAM-TV about Ryan Kechner, a pitcher for the Salt Lake Bees who is deaf. A Boston-area hospital has settled a complaint that it is not providing proper services for the deaf. The US Attorney's Office started an investigation against Beverly Hospital from a patient that it did not provide qualified sign language interpreters. In response, the hospital says it will start offering a combination of live and remote video services, train staff, track complaints and clarify its services to patients. Missouri's State Committee of Interpreters is offering videos explaining how to complain about an interpreter. The state agency has been licensing interpreters for 17 years.There are more than 600 licensed interpreters statewide. The video about how to file a complaint is posted below. You can see the others, about certification and licensing of interpreters by clicking here. The videos show how to file a complaint against a licensed interpreter and how the state investigates. They also explain the difference between certification and licensing of interpreters. Netflix is expanding its video streaming to include closed captioning. However, not all Netflix content is captioned and captioning preferences are not retained between devices. You'll know subtitles are available when the caption icon appears while the movie is playing. A former state director for special education is the new superintendent of the West Virginia Schools for the Deaf and Blind. Lynn Boyer is currently working at a DC nonprofit called Council for Exceptional Children. She'll have her hands full when she takes over July first. The school was cited for deficiencies in leadership, curriculum, safety and technology by the Office of Education Performance Audits. The Toronto International Deaf Film & Arts Festival starts Thursday and runs through Sunday. Luke Adams, the first Deaf contestant on CBS's Amazing Race, will play master of ceremonies at Saturday night's Award Presentation. Catherine MacKinnon started the event. She co-produced a film based on the life of Deaf UFC fighter Matt Hamill called Hamill. Find out more about the festival by clicking here. A new children's book tells the story of a boy and his mom who hire two women to paint his bedroom, both of whom happen to be deaf. They become friends 'with a splish of paint and a splash of fun." 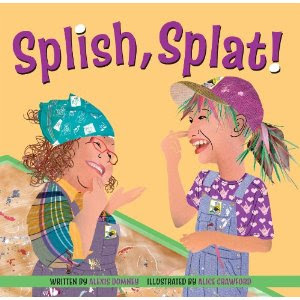 Titled Splish, Splat, the book was written by Alexis Domney, who attended the oldest school for the deaf in Ontario. The 26-year-old writer was able to add the work of graphic designer and illustrator Alice Crawford, who created collage illustrations for the book made out of scraps of paper, catalogs, fabric, and her own photos. The FCC is announcing plans today to offer emergency text alerts for hurricanes, tornadoes and other disasters to people in areas where there is imminent danger. It's part of a new network called Personal Localized Alerting Network, or PLAN. Four cellular providers (AT&T, Sprint, T-Mobile and Verizon) are volunteering to start the service by April of next year. Some phones, (newer iPhones and Android phones) already have the circuitry required to receive PLAN alerts. Some users will be able to get a software upgrade to activate the service. Cochlear Implants typically are being given to small children, but England's Yorkshire Post tells about an elderly man who had the surgery here. Almost one in five councils in England have cut services for deaf children, according to The Guardian. Read the story here. This Saturday the third annual Hearing Loss Association of America (HLAA) Walk4Hearing takes place at Chattanooga State Community College in Chattanooga, Tennessee. Last night's Celebrity Apprentice put the competing teams on a comedy show to raise money for their charity and in a second challenge, the celebrities had to make a promotional spot for On Star. Celebrities Star Jones and Marlee Matlin suggested to Donald Trump that singer Meatloaf should be fired. Matlin described him as "a tornado on crack." LaToya Jackson and Star Jones were fired while NeNe Leakes quit on her own. Some Gallaudet University students are protesting school rules that prevent them from using Visa cards to pay for expenses. That's because Gallaudet has decided not to add a service charges to the student bills, as required by the credit card company. One student choose to pay her $1,185 with a 15 pound bag of dollar bills as a protest over the policy, according to the student newspaper. School officials say other institutions, like NTID and RIT have the same policy. The Chicago Sun-Times looks at the coming murder trial of a deaf defendant here. This Saturday, May 14, the National Association of the Deaf will hold its Spring Benefit Gala in Berkeley, California. Actress Marlee Matlin will appear, along with two people who were featured in the documentary See What I Say: deaf rock star TL Forsberg and comedian CJ Jones. For more information, click here. Last week's episode of the FOX show Bones included a deaf character that stirred some controversy. Read about it here. A film about deaf Jewish child in Nazi Germany will be shown tomorrow on HBO 2 at 6:15 Eastern. Ingelore is a documentary directed by Frank Stiefel and narrated by his mother, Ingelore herself. You can see the trailer video below. Here are the winners in the Sorenson Communications annual "Express Yourself" Video Contest. They were announced last night at the California School for the Deaf in conjunction with DeafNation Expo Riverside. The Youth category winner is Daniella, from Chicago. She'll get $1000 for her effort. The General category winner is Melissa Malzkuhn, from Washington, D.C. She'll get a check for $1500. The Sorenson Employee winner is Robert Giuntoli, from Austin, Texas. He will also receive $1500. A deaf couple describe what happened when a tornado came through their Athens, Alabama home. A deaf person on trial in Britain was given the right to an interpreter as early as 1725. This was typically a family member, friend, missionary, or teacher, according to researchers at University College London. They found court records of 30 such trials that took place in the 18th and 19th centuries. The first record of a court interpreter appears in 1771. Details of the study are in the journal Sign Language Studies. The student newspaper at the University of Illinois offers a story about the difficulties faced by deaf renters. Read the article here. Parents from Utah Schools for the Deaf and the Blind held a rally today against the schools’ superintendent. Steven Noyce has held the position for about a year and a half. The board may decide whether to renew his contract at their next meeting in June. Most of those involved in the protest say Noyce supports listening-and-spoken language (LSL) over the ASL program at the school. A group of Noyce supporters have submitted a petition to the board. More than 70% of parents have been choosing LSL for their children, who often have cochlear implants. Jazz singer Mandy Harvey will make her debut tonight at the John F. Kennedy Center for the Performing Arts in Washington, D.C. The Denver native will receive the International Young Soloists Award and $5,000 to help her music career. Harvey is deaf and has recorded and self-produced two albums. A football fan has filed a complaint in court against the University of Kentucky, asking that captioning be provided at the stadium. Charles Mitchell is a season ticket holder with a hearing impairment who says its a violation of ADA law. The school had no comment. Eleven deaf inmates are suing the station of Illinois, saying their rights are being violated. The prisoners claim they have limited access to interpreters and other needed communication assistance. The suit says they aren't able to take part in training programs and religion services, like other inmates. They also complain about safety issues, saying deaf prisoners cannot hear fire alarms and other alerts. Illinois' state department of corrections is not commenting yet. "Michelle's specialty is taking students who are normally underrepresented in science -- minorities, women, students with disabilities, even students who say equations and formulas are just not their thing -- and helping them discover the scientist within. The women’s basketball coach at Gallaudet University will speak at the commencement ceremonies of Urbana University this Saturday. Kevin Cook is a 1983 graduate of the Urbana, Ohio school. Some 120 students will be graduating. Last season, Cook's team won 24 games with only four losses, earning themselves a bid to the NCAA Tournament. The Justice department has settled a complaint against the Yavapai Regional Medical Center in Prescott, Arizona. The federal investigation found that the hospital's policies are not adequate for deaf or hard of hearing patients. The hospital has agreed to change the policies, offer staff training, and make reports to the Department of Justice for the next three years. This Friday and Saturday, the DeafNation Expo comes to Riverside, California. For more information click here. Read about a deaf speedskater from Texas here. Got a problem with captioning? There’s a site that will take your comment and make sure it gets to the right TV network, local station, cable or satellite provider that needs to hear it. CaptionsON is an effort by VITAC – one of the largest providers of captioning in the country. The company hopes the website and accompanying video will help people understand how important the service is to viewers. Two deaf men are recovering from a knife attack that started last night when someone mistook their use of sign language for gang signs. The men were celebrating a birthday at the Ocean's Eleven Lounge in Miami, but a woman, Barbara Lee, thought the group was making gang signs in her direction. She confronted the group and although they motioned for her to leave them alone, she failed to recognize they were using sign language. Lee left the bar and came back with two men including Marco Ibanez, who stabbed two of the men. A bouncer and another man were injured in the melee. See a video about the incident from WSVN-TV here. The 2011 National Teacher of the Year earned her graduate degree in deaf education from Gallaudet University. Michelle Shearer is currently an advanced placement chemistry teacher in Frederick County, Maryland at Urbana High School. She previously taught high school chemistry and mathematics at the Maryland School for the Deaf. Shearer says the two biggest influences toward becoming a teacher were her parents, both teachers, and students at the New Jersey's Marie Katzenbach School for the Deaf, where she was a classroom volunteer as an undergraduate. She will receive the award given by the Council of Chief State School Officers Tuesday at the White House from President Obama. Guys and Dolls will be performed this Wednesday through Sunday at the NTID’s Robert F. Panara Theatre in Rochester, New York. Actors will use ASL while their lines are simultaneously voiced by interpreters. More than 100 students, faculty and staff are involved in the production. For more information, click here. WESH-TV in Orlando offers the following video report below about an FCC ruling that affects video relay operation (no captioning).